The Floating Hut is shaped like the traditional house – a rectangular base with a gable roof. 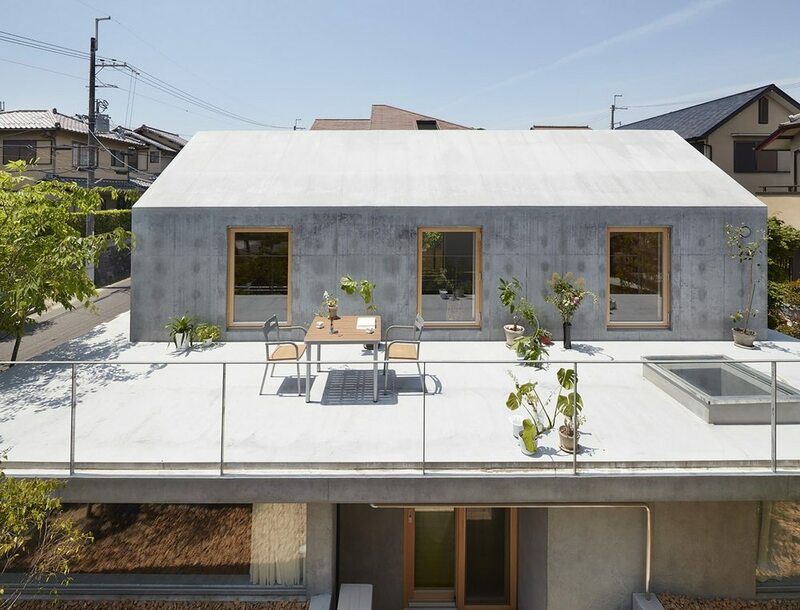 The upper part of the house sits on a slab of concrete, like it’s hovering mid-air. The slab is wider than the house’s floor area, taking the form of a terrace. It is wider and bigger on the south side, a space perfect for socialization. The upper part of the house sits on a concrete slab, making it look like it’s floating. Several glazed openings were strategically placed on the “floating” part of the house. These play an essential role in lighting and ventilation. Concrete is the dominant material of choice, interspersed with timber frames. Inside the house, the same materials are used. Concrete and timber are found both inside and outside of the house. The design of Floating Hut embodies both the past and the future. It shows respect to tradition but is not afraid to venture into new territory. The construction takes place in a residential zone developed 30 years ago during the bubble period. Although this region used to be an idyllic countryside, following its development by a single developer to residential area as a city block, a rational subdivision into isolated houses surrounded by fences and distant from each other, have been applied to the zone. Additionally, as a result of a house builders’ famous 80’s and 90’s marketing strategy in Japan using the symbol words “My Home” to reply to the increasing housing demand following the economical growth during the same period , these houses were provided a pitched roof. Over time, this urban layout and roof shape became an identity for the zone and dwellers began to protect it, at first, as a rule for every new building or modification of an existing one, then, finally, by turning it to a district plan law demanded to the government in 2015 by the “residents association” . As retaining walls already exist, we chose to partially burry the ground floor solving the height’s scale problem. As a result to these manipulations, the house gets a scenic beautifully shaped gable, a floating terrace connecting interior and exterior and a canopy producing approach and parking. Following this scheme we were able to give some meaning to the existing rules and laws while creating a clue for the future developement of the zone. The House in Kodaira is another Japanese home with a distinct flair. Find out what it is by reading our post!